DDU Hospital Recruitment 2019 - Walk in for Sr. Resident Posts in DDU Hospital, New Delhi on a Regular Basis. Candidates are invited by Deen Dayal Upadhyay Hospital (DDUH), Delhi Govt. to attend walk-in-interview to be held on 18 Apr 2019 at 09:30 AM for 4 vacancies. DDU Hospital Recruitment 2018 - Walk in for 20 Jr. Resident Posts in DDU Hospital, New Delhi on Regular Basis. Candidates are invited by Deen Dayal Upadhyay Hospital (DDUH), Delhi Govt. to attend walk-in-interview to be held on 23 Apr 2018 for 20 vacancies. 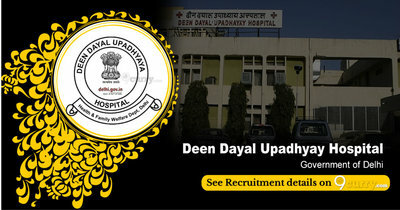 Deen Dayal Upadhyay Hospital (DDUH), Delhi Govt.